With Steven Proctor prior to accompanying Steven at a Violin Recital on 25 August, at Stockton Parish Church. 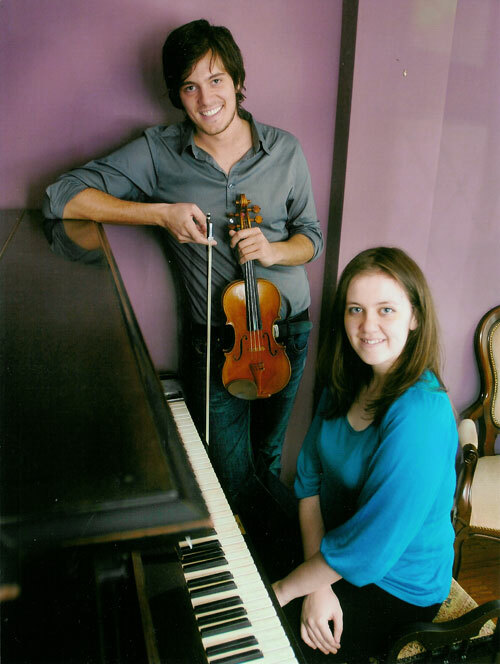 Alison has played alongside Steven as accompanist, duetist and soloist on many occasions. Steven was born in Hartlepool in 1985. He began his studies with Pamela Thompson when offered lessons at his local primary school. Within a short period of time, Steven had already won a number of awards in local festivals and competitions. At the age of twelve he was offered a place at the Junior Royal Northern College of Music (RNCM) in Manchester, where he studied with Deirdre Ward for five years. Whilst at the Junior RNCM, Steven received specialist training in violin, piano, chamber music, aural, composition, theory and orchestra and performed in numerous concerts both internally and externally. He was also a member of the National Youth Orchestra of Great Britain for four years. Steven performed with the NYO in concert halls all over the UK, including Bridgewater Hall in Manchester, the Barbican in London and the Symphony Hall in Birmingham as well as four performances at the BBC Proms in the Royal Albert Hall which were broadcast live on BBC radio and television. He has also worked with a number of the world’s leading conductors including Sir Andrew Davis, Yan Pascal Tortellier, Sir Colin Davis and Sir Simon Rattle. In 2004 Steven went on to study at the Royal Northern College of Music to study with Professor Wen Zhou Li and Philippe Graffin. He has also taken part in a number of RNCM Masterclasses with violinists such as Ivry Gitlis and Zvi Zeitlin. He was personally invited to work with Giandrea Noseda, principal conductor of the BBC Philharmonic, in the summer of 2006 in Stresa, Italy. BMus (Hons) course at the RNCM, studying with Maciej Rakows.